May 11, 2017 – NASS Passes 2017 Appropriation Bill Into Law, Raises N7.28Billion Proposed By Buhari To N7.44 Trillion…. The corrupt politicians currently sitting on the wealth of Nigeria have raised the N7.28Billion budget President Buhari proposed last year to a whopping N7.44 Trillion. The Appropriation Committees of the Senate and the House of Rep. passed the bill today. National Human Rights Commission (N1.2 billion) —- Human Rights Commission got the lowest. This explains why there is no Human Right in Nigeria today. 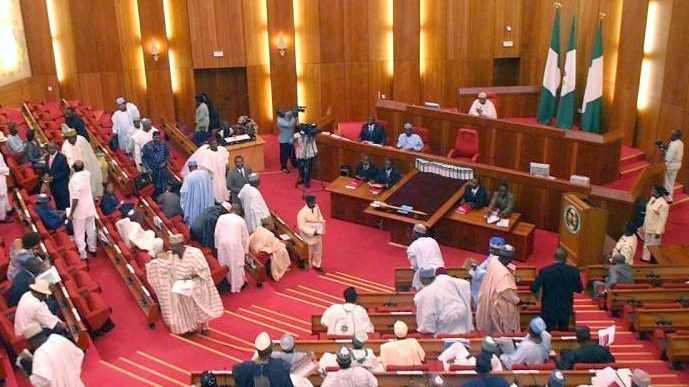 See the budget the Nigerian lawmakers passed for the national assembly alone this year. In the 2017 Appropriation Bill, the National Assembly will now get a whopping N125 Billion. In the rowdy session that happened this morning, the selfish lawmakers were pushing for N150billion but it was later reduced to N125billion. Service Wide Vote- N391, 396, 169. The reality is, THERE ARE NO HUMAN RIGHTS IN NIGERIA. What is #1.5 billion compared with #125 billion? They might as well add the so called “human rights” budget to the National Assembly budget. What service are they rendering to Nigeria than deplete our resources with their extravagant and wasteful life-styles, at the expense of the citizens? Keep milking Nigeria and growing pot bellies – greedy, heartless politicians. Diaris God o.